To Make a Bloomin’ Onion at Home is really quite easy. All you need are some large sweet onions or onions of your choice, whole wheat flour, spices, milk and eggs. 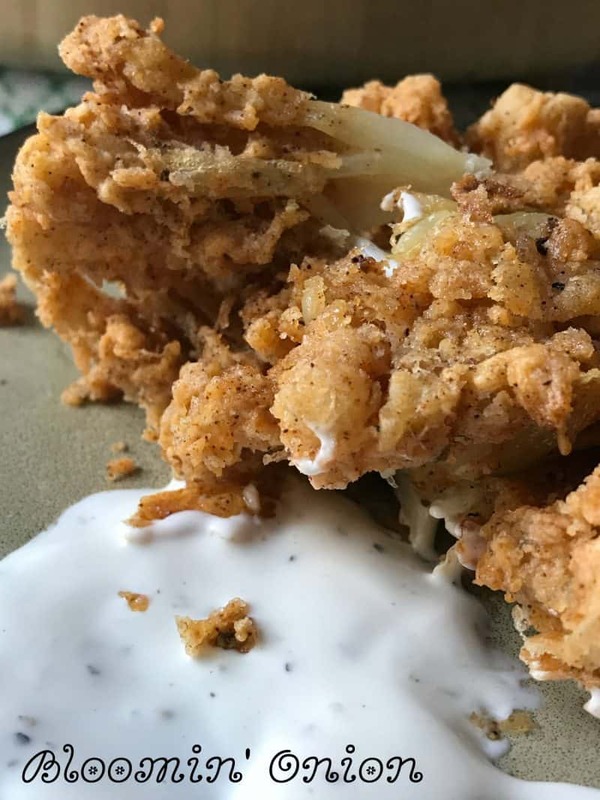 Along with oil, a deep-fat fryer or deep cast-iron skillet and you’ll be enjoying bloomin’ onions at home in no time. 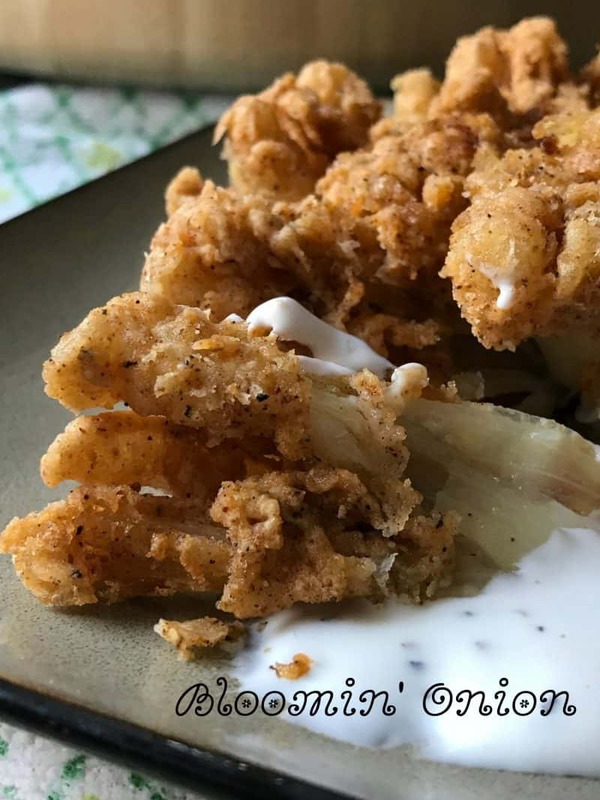 Bloomin’ onions or sometimes called “onion blossoms” have been around for for-ever and with good reason. Bloomin’ onions are delicious. 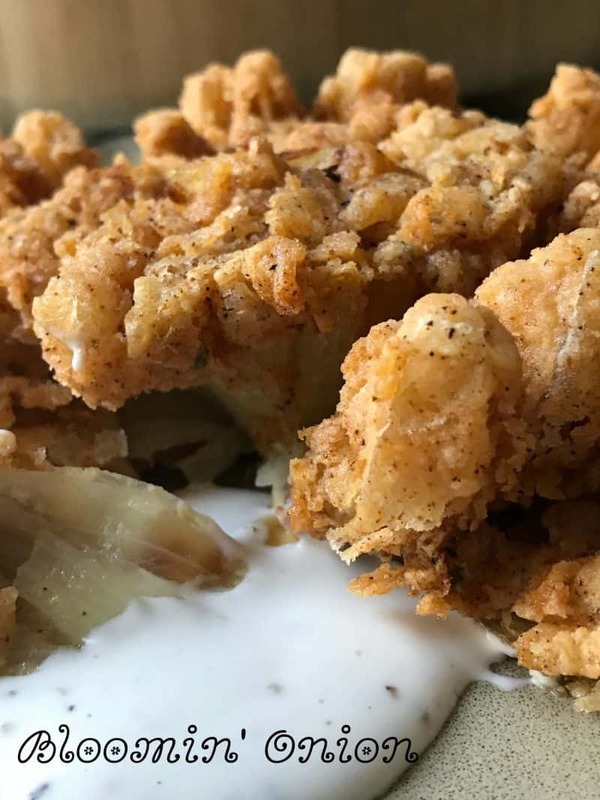 Just about everyone has heard of a Bloomin’ Onion and most people have probably even eaten a bloomin’ onion. 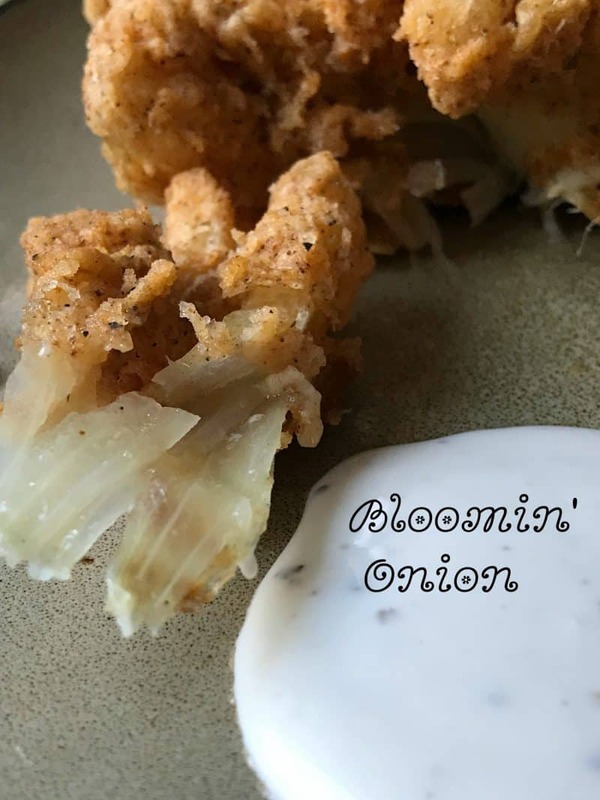 My first bloomin’ onion experience was when we ordered one at Outback Steak House several years back. Outback was one of many new restaurants that opened in our area at that time. What inspired me to make a bloomin’ onion at home was, I came across this bloomin’ onion maker on one of my many thrift store shopping expeditions. In fact, you can find these gadgets at just about every Goodwill, St. Vinny and Thrift Store yo walk into. It got me thinking,”Do these things really work?” Is this another “kitchen gadget?” I decided to take the plunge and buy one, I mean it was only $2.00. The name of the “onion machine” I purchased is called: Great American Steakhouse Onion Machine. It came in the original box, with the onion machine and a cookbook & instruction booklet. The only thing missing was the corer/poker unit. In the booklet under the heading of “Helpful Hints” it states that Great American Steakhouse Onion Machine is ideal for cutting onions, bricks of cheese, apples into wedges and to make steak fries. When making a Bloomin’ Onion I followed the step by step directions in the booklet. The directions were easy to follow and made the process go smoothly. Great American Steakhouse Onion Machine comes with this warning: This product has extremely sharp blades and must be handled with the utmost care, keep this product away from children. I can definitely vouch for that, the blade on this onion machine is super, super sharp. *The directions given below are the exact directions given in the booklet. Let’s Get Cooking! 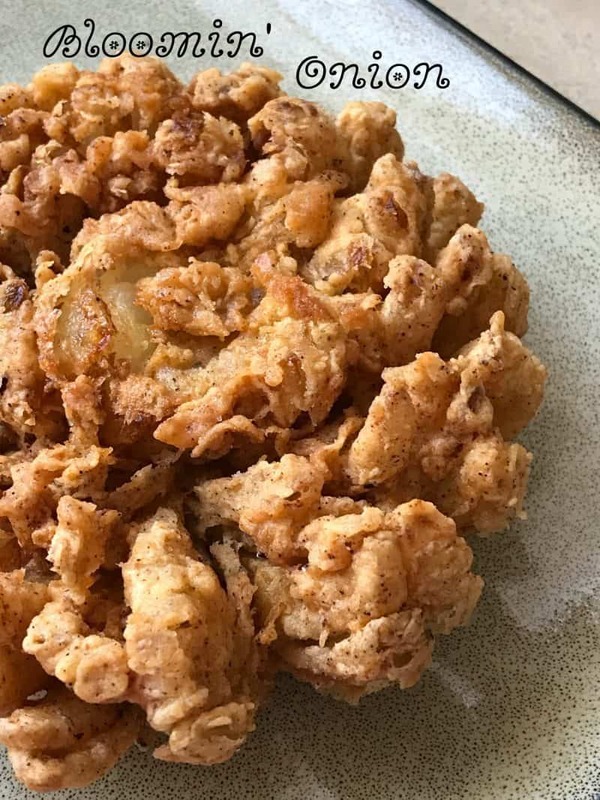 Make a Bloomin’ Onion at Home using the Great American Steakhouse Onion Machine. Also include is the recipe for Great American Steakhouse Dry Onion Mix. Take a medium to large onion and clean off the skin. The larger the better. Place onion on its side and cut off top quarter of the onion. Make sure you do not cut the root side of the onion or the onion will fall apart. The root side of the onion will have brown grass-like particles. Take the corer/poker unit and tap the bottom of it on a table to remove the inner poker. Place the corer into the center of the cut end of the onion, inserting until it’s 90% of the way into the onion. Do not go all the way through the onion or you will puncture the root. Once you are close to the bottom of the onion, rock the corer from side to side until the onion core loosens from the onion. Remove the core. If the onion core becomes lodged inside the corer tool, simply push the poker into the corer tool to free the stuck piece. Lift the top frame off of the base of the Onion Machine. Place the onion onto the onion cup, this is the round part sitting on top of the base, with the root side down. Align the bottom of the top frame with the top of the poles protruding from the base. Very swiftly and firmly, press down on the top frame until it completely slices through the onion and meets the base. If the blades do not completely cut through the onion, lift the top frame, with the onion, from the base and swiftly push down on the whole unit again until the blades completely cut the onion. At this point, the onion should be cut into 20 petals held together at the root. The petals will be sticking up through the blades. Remove the top frame from the base by cupping the onion petals and lifting the frame straight up. Should the onion get stuck in the blades, use the poker unit to free the onion petals. Do not use your fingers as blades are extremely sharp. Remove the top frame and put it aside. Fill a bowl with ice-water. Place sliced onion upside down in ice water and soak for one hour. Soaking is necessary as it makes the petals larger and stronger.Soaking in water also helps the onion petals to maintain their shape during cooking. Once the onion has soaked for the full hour, remove from the bowl and shake off excess water. Place onion root side down on wax paper or on a dish. Lightly sprinkle or sift Great American Steakhouse Dry Onion Mix on top of the onion. Turn onion onto its side. With one hand, gently spread the petals apart. With the other hand, lightly sprinkle mix onto every petal. Be sure to completely cover each layer of petals with dry mix. While still on its side, rotate the onion until all the petals are covered with dry mix. Turn the onion root side up and shake off any excess mix. In a large bowl, mix four eggs and four cups of milk. Lightly beat to create a wet batter. With the root side down, place the onion into the egg and milk mixture. Gently push petals down and separate each petal with your fingers to allow the wet batter to get in between each layer. Next, rotate the onion so the petals are facing downward. Let the onion remain in the wet batter for 10-15 seconds. This allows the wet batter to cover the whole onion. Take the onion and turn it root side up, allowing any excess batter to drip back into the bowl. Remove the onion from the wet batter and repeat step number 8. In a pot no smaller than 5 quarts or in a deep fryer, preheat enough oil to completely cover onion when submerged. The oil should be heated to 375 degrees. Use a thermometer to ensure correct temperature. Spread petals apart once again and place onion, root side up, into preheated pot of oil. Wait 5 seconds. Using a long-handled cooking utensil, push down on the root of the onion, submerging it deeper into the oil, for 3-5 seconds. This allows the onion petals to expand like a flower. To bake: place onion on cookie sheet and bake at 375 degrees for 3 minutes or until golden brown. After the onion has cooked for three minutes, turn the onion over so the petals are facing upward. Cook for an additional 3 minutes. Using either a flat fryer basket or a large fork, remove the onion from the oil, root side up. When using a fork, stab the center of the onion to remove it from the oil. Let excess oil drip off onion into pan. Place onion, root side down, on a double layer of paper towels to drain excess oil. Once the oil has drained, cut out the remainder of the onion core using the corer tool. Be careful as the onion will still be very hot. Does the flour go with the milk and the eggs?